It’s that time of year again! April brings clear skies, nice weather and the Arizona food and booze month. Yup, I really just called it that because there’s tons of local food and wine events this month. Case in point, next weekend’s Scottsdale Culinary Festival. Every year us Phoenicians totally look forward to this event. There’s a weeklong of great food and wine dinners (check out the event schedule at www.scottsdaleculinaryfestival.org) plus The Great Arizona Picnic over the weekend. This one’s great for two reasons: everyone goes, and watching people’s ridiculous outfits is Oh So Fun. What to wear to the Scottsdale Culinary Festival’s Great Arizona Picnic is quite simple: it’s outside, it’s Arizona. Dress accordingly. Please note: By no means am I talking about any of the other weeklong events that take place in the evening. In any case, most of those dinners are cocktail attire. This is The Great Arizona Picnic specific only because this, unfortunately, is where most of the fashion faux pas take place. It’s hot. It’s outside. There’s grass. In case you don’t remember my rules from previous outdoor event posts, let’s review. No stilletos. NO STILLETOS IN GRASS! And yet girls insist and I’ll never understand why. A great pair of sandals like these Antik Batki Langoa flat sandals from shopbop.com. $210. Or a cute summer wedge like these Philosophy di Alberta Ferretti wedges from shopbop.com. $595. A short, casual dress in a bright hue like this Vanessa Bruno silk t-shirt dress from net-a-porter. $300. A playful jumpsuit. I’m loving the color of this Adam playsuit. Net-a-porter, $550. Some cutoff shorts. Personally, it’s my favorite look though I can’t pull off jean shorts to save my life. These Current/Elliot distressed boyfriend shorts are a pair everyone should have in their wardrobe. I like how the outfit is punched up with a bright sweater and wedges which are very daytime/outdoor apropos. A flirty skirt. This works only if you wear it casually like styled above with a plain tank and sandals. Otherwise you’ll just look overdone. Just Cavalli English Garden skirt, $215. Net-a-porter. You can’t go wrong with a nice pair of denim. I’m really feeling the wash of these Citizens of Humanity Kelly bootcut jeans. Paired with cute wedges, a nice top and an oversize bag would be an effortless, comfy and stylish look. $190. Net-a-Porter. It’s sunny Arizona! Don’t forget a fabulous pair of oversize sunglasses. 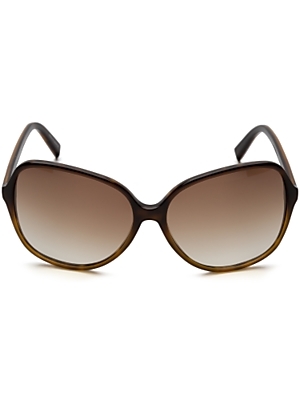 I like this brown-shade of Dita oversize sunglasses from Intermix. $225. And be sure to lather on the sunscreen. I’ve gone for a few years now, and I’ve gotten toasted in the sun. Good tips! Girls look so ridiculous hobbling around in their sky-high heels at these type of events. They’re clearly ubcomfortable and it doesn’t look good so please no more! i like the first dress. room for lots of drinking and eating. I’m loving the Antik Batki Langoa sandles. Classy and comfortable all at the same time. My kind of style. Especially for a day out in the sun! Many thanks for telling. I have not in fact had time to look over it yet however I’ve save it to my bookmark so I will be able to look over it in the future.